It was their lowest winning score in 87 years but the Wallabies took an important step at Etihad Stadium in their quest to be a "team for all seasons". 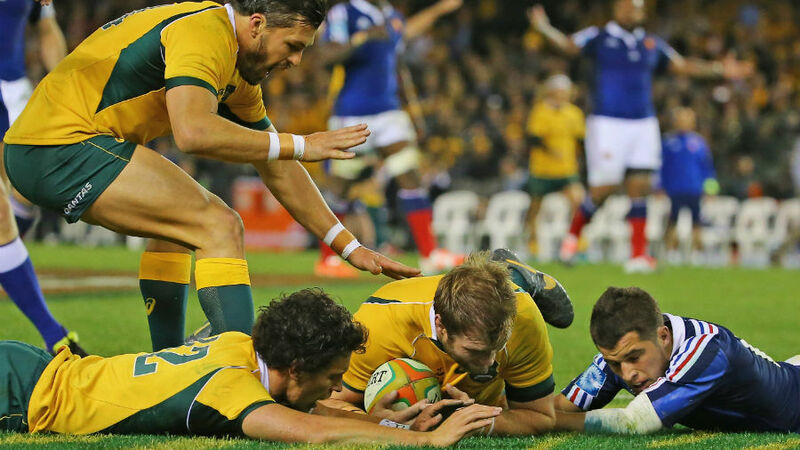 A week after blitzing France 50-23 in a sizzling seven-try display, Australia's dour 6-0 second Test victory was an old school triumph born of grit, character and scrum dominance. Boosted by 10 changes, Les Bleus upped their passion and intensity, and made it hard work in a tense contest that never broke open. Wallabies coach Ewen McKenzie accurately likened it to a game of chicken in the scoreless first half as both sides held their nerve in sticking to their kick-happy territory tactics. In the second, the home side grabbed the ascendancy, kept it, but couldn't break free. Three penalty attempts were missed, the playmakers lacked patience near the line and the French defence held strong. The winning scoreline was Australia's lowest since they beat Ireland 5-3 in 1927, but even then the Wallabies scored a try. McKenzie said they would be their own toughest critics for failing to put the game away and failing to grab a five-pointer. However, tighthead prop Sekope Kepu highlighted the nature of the victory by saying the success, in finding a foreign way to win, was more satisfying than the first Test try-fest. With the World Cup 15 months away in England, McKenzie agreed the no-frills victory - a sixth straight win - was a crucial step forward. "Ideally you want a team that can cope with all circumstances and the All Blacks have always done that," he said. "They find a way, you saw that against England last week (20-15) and now they did it differently this week (28-27), but they still got there. "And that's what I want us to be: A team for all occasions, to be a team for all seasons. We're actually finding ways to win in varying circumstances. Once you know what winning looks like you can take it anywhere." The Wallabies are now enjoying their best streak in nine years and can extend that further in Saturday's third Test at Sydney's Allianz Stadium. French coach Philippe Saint-Andre was right to rue an opportunity lost as his side missed two first half penalties and Yannick Nyanga knock-on his own chargedown with the line at his mercy. But on the back of their scrum, vastly improved from when taught a lesson by the All Blacks and South Africa last year, the Wallabies dominated after half-time. "As a pack we have to get the right respect from everyone and I think we're moving in the right direction to do that," Kepu said. "But this week means nothing, we have to do it next week and again after that. To grind away a win like that it's one of those that's probably better for you [than last week's]. It's a tougher battle and I feel it's more satisfying."